You might remember the saga of Sebastien Gacond, the triathlete who wanted to make it as clear as possible that he did not like sweaty testicles in his face. (He's not gay; NO. He's into chicks, man.) Well, rugby player Ben Cohen, who has developed a far wider following of gay men, is quite proud of his gay fans. So much so that he's hosting a Big Gay Fan night in London this March. Cohen, 29, who helped England win rugby's World Cup in 2003, told Outsports through his representative about his plans. 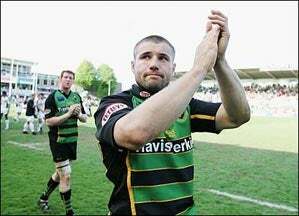 "Ben is currently in the middle of his testimonial year celebrating the last 10 years of his rugby career. He understands that a high proportion of his fans are gay and to thank them for their constant loyalty through good and bad times he is planning a gay night celebration in London in March. Full details will be announced later this year." Cohen, who is married and whose wife is expecting twins, is wrapping up a historic career for England and clearly is reaching out (around?) to his most devoted fans. Wonder if Kordell will show up.